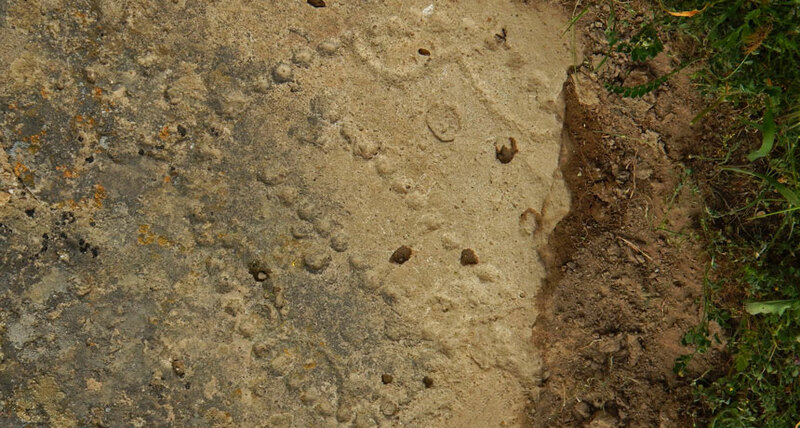 GAME ON A dot pattern chiseled on stone at a Eurasian rock-shelter indicates that an ancient Near Eastern game called 58 holes quickly spread to a distant herding population, a scientist says. DENVER - A dotted pattern pecked into stone at a remote Eurasian rock-shelter represents a Bronze Age game that was thought to have existed at that time only in Mesopotamia, Egypt and other Near Eastern regions. The game is known as 58 holes, or Hounds and Jackals. Archaeologist Walter Crist of the American Museum of Natural History in New York City described his surprising discovery of a roughly 4,000-year-old example of 58 holes in present-day Azerbaijan on November 15 at the annual meeting of the American Schools of Oriental Research. Azerbaijan sits between the Caucasus Mountains and the Caspian Sea, some 1,000 to 2,000 kilometers from the Near East. "Bronze Age herders in that region must have had contacts with the Near Eastern world," Crist said. "Ancient games often passed across cultures and acted as a social lubricant." While conducting an internet search of publications about 58 holes, Crist saw what looked like an example of the game's layout in a photograph from a rock-shelter published in an online magazine called Azerbaijan International. He contacted a colleague in the Eurasian nation who helped to arrange a site visit in April 2018. Once there, Crist found that the site shown in the magazine had been bulldozed for a housing development. But a scientific official in Azerbaijan told him of another rock-shelter with the same dot pattern. Crist, who has studied early Near Eastern versions of 58 holes, recognized the two-person game when he reached that site. The pattern consists of two central rows of dots and two outer rows of dots that curve in to meet at a slightly larger dot located above the central rows. Dot numbers can vary but usually total 58. Players are thought to have rolled dice to move pebbles or other pieces on each side of the game, each trying to reach the top first. This game might have been a precursor of modern-day backgammon. Themes and styles of rock art found along with the game in Azerbaijan date to the Bronze Age, Crist says. Techniques to date rock art more precisely have not been used on the finds (SN Online: 11/7/18).